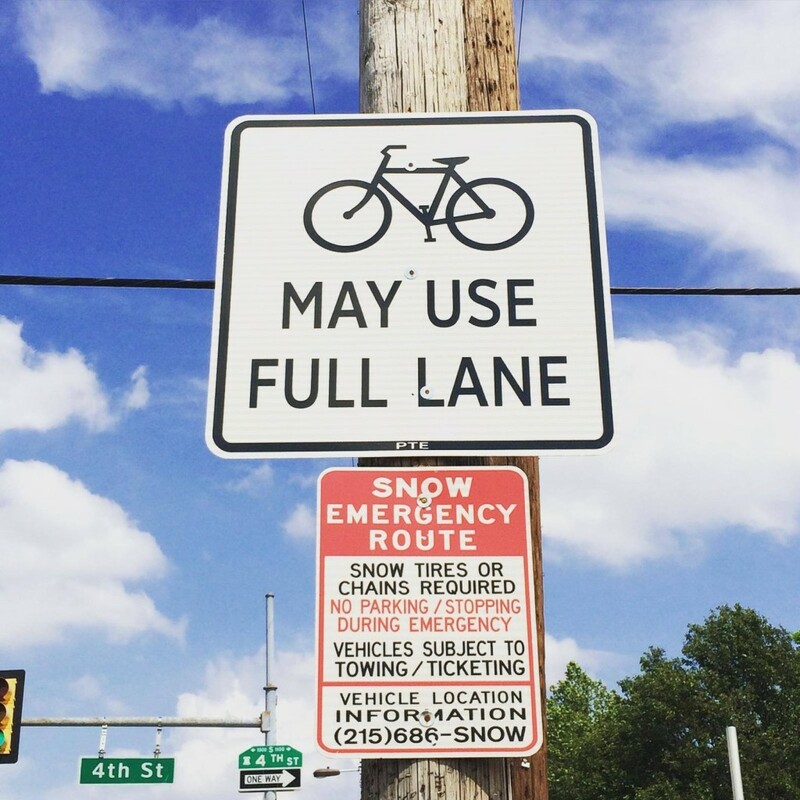 Across Philly, signs with a short and effective message have gone up along roadways and spell out the law plain and simple: Cyclists “May Use Full Lane.” And a new study, released last week, shows that these signs are a good thing. In fact, “May Use Full Lane” registers with motor vehicle drivers better than the former standard, “Share The Road” signs ever did. “The right of bicyclists to use a full travel lane is not well-recognized by motorists or bicyclists, which contributes to safety concerns and creates social friction among them,” reads a study from North Carolina State University. Two researchers from the Department of Forestry and Environmental Resources at North Carolina State University have studied the effectiveness of the three most-used traffic control devices, as seen below, that indicate bikes may use a full lane. Their findings came to some simple conclusions. Of the 1,824 eligible respondents, it was found that those who saw the “BICYCLE MAY USE FULL LANE” sign, they were more likely to agree that cyclists have the right to ride in the center of a lane and not pull over to allow cars to pass. The study also speculated that a combination of signs along side a road and marking on the road itself could improve driver’s knowledge of how much of a lane a cyclist can take up. One local sign, as show below, can be found at 3rd and Wildey Street in Northern Liberties. “Can everyone just get along? Some riders and drivers are jerks. Most of us have moments where we are less than aware of how our actions affect others. But we are all people getting from point A to B hoping to get there safe,” said Jennifer Harrison in response to a posting of one of the signs at 4th and Washington on the Coalition’s Facebook page. “Is this a real sign or is it street art?” commented one disbelieving user on Instagram who saw a post of the Northern Liberties sign. Yes, indeed they are real and more are due to be put up as the city works its way to developing the 13th and 15th Street Bikeways. Simple language usually is the best means to convey a simple point but it remains to be seen how effective these signs will be at calming some hot-headed attitudes in our streets. I love the proliferation of these signs. My one worry is that motorists will think that bicyclists’ right to use the full lane is restricted to where these signs are posted. You want the whole lane. Abide by the street laws and stop at the stop signs. You must follow all road signs just like any other motor vehicle traveling on a public road. You blow the stop sign FU. I encourage the signs. There are already many motorists like David Oh and Mr. Roszko that do not believe bicyclists should be or actually are legally allowed to use streets without bike lanes or other signs. So I think these signs can’t hurt, but they may help a few confused but open minded drivers understand basic traffic law. @Alexander Roszko: Bicyclists don’t break the law any more than motorists. I see motorists breaking the law almost constantly on the roads. How do you know that Aaron B runs stop signs? You don’t. You’re just another prejudice bigot trying desperately to rationalize your hatred for people who are not like you. Bicyclists already had the right to use the full lane. These signs only reinforce that because ignorant self entitled children like you couldn’t be bothered to learn the rules of the road. If you want to use the whole lane then obide by the fu#$*&@ street laws. Yes, bikes riding in the road have to abide by ALL the same laws as cars, trucks, busses, and motorcycles. You want it one way but not the other. I remind you I am in a 2 ton car and you and your bike might weigh 200lbs. You do the math. Get the fu$@ out of MY way if you see me. I will honk and you will want to move aside. When you break the law by running 3 stop signs, give ME the finger, ride on the sidewalk in a commercial area, and then expect to use the entire lane. Recognize you can be ticketed lime any other vehicle if you drive on public roads. Studies show that motorists and cyclists commit moving violations at about the same rate – perhaps you are allowing confirmation bias to color your perception? You seem quite angry. We should all do our best to get along. I understand the point of cyclists obeying ALL street laws, which is true. The law being harped on here is STOP signs. So, you mean to tell me that you would be perfectly fine, patiently waiting behind a group of 20 cyclists while EACH AND EVERY INDIVIDUAL CYCLIST comes to a FULL AND COMPLETE STOP before proceeding as the law reads? SURE you would! Using a full lane and not having to squeeze between parked and passing cars is both a safety issue and our right. However most of the traffic rules you mention bikers should obey in return are made for cars i.e stop at stop signs, do not run lights etc. A biker can easily see if there are cars coming from an intersecting street just by slowing down, we can see better, and we’re slower so this can be done without any risk whatsoever, it is done all the time. or riding on sidewalks at a slow speed when not many people are on it, this doesn’t cause any problems either. But you pushing us out of the roads is a problem. what you want us to do are just whims. what we want to be able to do are really necessary things. Mr. Roszko is right. If you want the full lane, follow the traffic laws. That means bringing your car to a complete stop at stop signs, not driving even 5-10 mph over the speed limit, and not driving too close to cyclists. Also if you’re driving around in a 2,000 in car, maybe be more considerate of the other road users you could easily injure or kill instead of threatening them. Alexander Roszko – Are you really threatening to run cyclists over with your ‘2 ton car’ and then lecturing them that they need to remember they can get tickets for running stop signs (something cars do as well)? Try not to sound like a homicidal maniac when you give advice on how to be a good citizen, ok? Respect life. Realize the 5 seconds you lose waiting for a cyclist is nothing. Freaking out about it only raises your blood pressure. And if you ever run one over with your car, you will go to jail, and surely regret it once you cool off and realize that person had parents, friends, possibly a spouse, children… Get a grip, fool. And seriously, find something better to do than troll the bike coalition website, it looks pathetic. I like stopping at every stop sign and light. Now as I ride down the the middle of the road all will see why many bikers “blow threw” those stop signs as it actually keeps traffic flowing. Because when I come to a complete stop you will see how slow my takeoff is while your riding behind me. It is funny how no one comes to a complete stop at a stop sign in Philly but we all want bikers to. It is everyone right to drive how they want to drive and last time I check it was the governments job to enforce the law. If anyone wants to use the whole lane then they have that right to no matter if they speed once in a while or do not come to a complete stop or illegally pass a bike (remember a bike is just like any other motor vehicle traveling on a public road) or break some other traffic law. You just risk getting a ticket like any other moving violation you don’t lose your right to operate said vehicle. I have done both drive with bikes and ride my bike with cars…. HAVE YOU? If not then I invite you get out of the car and come ride. Then you will be able to offer advice and feedback on how to bike around the city. Until then you are kind of like that guy sitting at home on the couch telling that QB on TV how to play football. So I’m curious. I’ve been both a driver and a bicyclist (in Seattle) for 30 years. I’m fine with sharing the road, but I have to ask: When bicycles use the full lane (and I understand some of the reasons to do so), they are almost always travel at speeds slower than cars, and slower than the speed limit. (There are exceptions, of course). This generally forces all vehicle traffic behind them to slow down to the speed of the bicyclist, which is frustrating. For example, if a car is travelling at 15mph on a street with a speed limit of 30mph, it is considered at best annoying. Why should this be any less annoying than a bicyclist travelling at the same speed and blocking traffic? I’m not arguing rights, or laws, just courtesy. I guess my question is, to those bicyclists who insist on using the full lane, how do you handle the question of cars behind you in the situation? Do you try to allow them to pass, or do you just let them wait? Please put these signs up along the corridors of streets where cyclist have to take the lane in order to survive the traffic. EX. : 63 from arch to spruce st’s. Depends on the situation first come first served is my basic motto. I try to look for places where I can release traffic when it is safe on two lane roads. On multilane roads I rely solely on the passing lane. to be used by those wishing to pass me.